I've been a fan of Kellog's wheat + sweet cereals for years. I used to eat the cereal Toppas which has now become Frosted Wheats and this appears to be a smaller version of this, although the size change makes the flavours a little different. First up is the 'original' flavour which is essentially a Frosted Wheat hit by a shrink ray - a little parcel of wheat with some 'frosting' or icing on the outside to wake you up a bit. 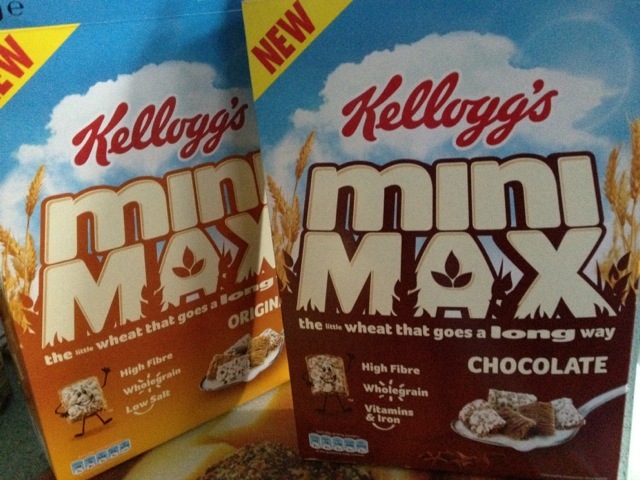 They have a cute little man made out of one on the box - who they have no doubt named Max - he's not as cool as the Krave Krusader, but it's another step towards making memorable cereal characters again. The cereal itself isn't as satisfying as the bigger pieces in Frosted Wheats - it's hard to pinpoint why though. Maybe it's my years of conditioning to the perfect balance of the existing cereal, and not that this just tastes less satisfying. Either way I'd only get this on special offer days and stick to the existing cereal (unless this replaces it!). The chocolate one is also a bit odd - it's almost like the wholegrain version of the package here is somehow more wholewheat than the larger versions. The texture seems wrong and the chocolate flavour just isn't that noticeable over the icing. I'd be more likely to pick this up again than the original flavour, but only because there isn't a chocolate variety of that (the alternate there is raisins - ick!). I think that children and people who haven't tried Frosted Wheats may appreciate the smaller parcel size on offer here, but I wasn't a massive fan. The wheat parcel concoction is one that supermarket own brands seem to excel at so I'm not sure this will last that long in the crowded UK market so try it sooner rather than later!